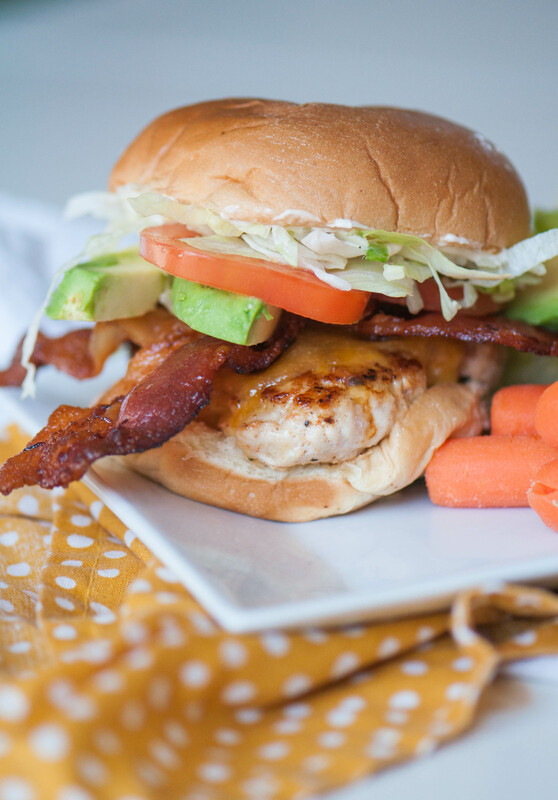 These Turkey Club Burgers are loaded with thick-cut bacon, melted cheddar, lettuce, tomato and avocado to create a new summer favorite. Perfect for the 4th of July because what screams America more than bacon and burgers? Do you guys love those crazy burgers with 15 toppings that you can’t even bite into? They are everywhere these days and always seem fun and different but this is how it ends up going down with us. I endlessly browse the menu, considering which crazy burger I’ll choose while Joel just sits there chuckling under his breath. He knows what will happen. The server comes and I always say “Can I have a bacon cheeseburger please?” Every time. Being a food blogger you would think I would go for the crazy but when it comes to burgers I just prefer something simple and classic. Except at this place I get a little crazy and order the Nacho Momma. See, I can live a little. Since I love the classics, I decided to take the humble but completely delicious turkey club sandwich and turn it into a burger just in time for 4th of July parties. Just a few simple switches made for a delicious burger. Rather than deli turkey, the star is a turkey burger. I know turkey burgers have a bad rap for being dry and boring but stick with me because I have some tips to help create a juicy turkey burger you will actually want to eat. First, I start with some thick-cut bacon. Because if you’re making bacon you might as well go for the gold. Nobody likes a slacker. I decided to cook everything for the burger on a griddle (or a large skillet if you don’t have one). When you grill turkey burgers, all the juices drip off and leave you with a dry puck. A griddle or skillet helps keep them juicy. I almost said moist, sorry about that. Anyway, once the bacon cooks there is a nice layer of bacon grease on the griddle which helps flavor the burgers and adds a little fat. I also added a little bit of the bacon grease to the ground turkey to keep them from drying out. My last turkey burger tip is adding grated onion to the patties. Not only does it add moisture but there is also a nice flavor punch without the crunch of diced onions. AKA you can trick your kids. Once the burgers are almost cooked through slap on some sharp cheddar and let it melt. To make these burgers a true club, top them with lettuce, tomato slices and a nice slather of mayo. I added a few avocado slices to add another creamy, fatty element. So there you have it friends. My ultimate not too fancy but still crazy delicious burger for all your celebration needs. Heat a griddle or large skillet over medium heat. Cook bacon until crisp then remove to paper towel to drain. Pour almost all the bacon grease into a bowl, leaving a little for cooking the burgers. In a bowl, combine the turkey, 1 tablespoon bacon grease, garlic powder, paprika and grated onion. Gently mix together until just combined. Form into 4 balls and season generously with salt and pepper. Place each ball of turkey onto the hot griddle several inches apart and immediately smash until thin. Only smash once. If you continue pressing as they cook, all the juices will release and leave the burgers very dry. Cook until browned and cooked through, about 2 minutes per side. Top with cheese and allow to melt. To assemble burgers: spread bun with mayo, top with burger, bacon, lettuce, tomato and avocado.